Samuel Boulds Barron who was born 16 Oct 1808 in Greene County, Georgia and died 8 June 1886 in Nacogdoches, Nocogdoches, Texas married Phoebe C Barber born 1818 and died 1900. They had a number of children. Their known chidlren are:Sarah Elizabeth Barron 1838–1924, Mahala Ann Barron 1843–1910, Samuel B Barron 1844–1932, Tillitha Barron born 1845, J T Barron 1845–1880, Phineas Barron 1854–1939, Marcus LaFayette Fate Barron 1857–194, Louisa J Barron 1859–1891. While Samuel B Barron have descendants that were residents and natives of the Shoals area, it is Samuel Boulds Barron’s daughter Mahala Ann Barron who married William Wilson Walker that is of interest at present.With all the bravery in the Revolutionary War, the Indian Wars, the War of Northern Aggression, and the Vietnam Conflict that Barron men fought in and Barron wives and families suffered through, it is the infamous that seem to catch interest. Mahala Ann Barron was born about 1843 in Nacogdoches, Texas. Her parents were Samuel Boulds Barron and Phoebe C Barber. She married William Wilson “W.W.” Walker on March 18, 1886. They divorced on March 24, 1910. Mahala Ann Barron Walker had a daughter named Cumie Talitha Walker. She was born 21 Nov 1874 in Nacogdoches, Texas. Cumie Talitha had siblings by the names of Charles Walker and Mary Elizabeth Waker Toms. Cumie Talitha Walker married Henry Basil Barrow. Cumie Talitha Walker Barrow died 14 Aug 1942 om Dallas, Texas. Henry Basil Barrow and Cumie Talitha Walker were the parents of Elvin Wilson Barrow, Artie Adelle Barrow Keys, Marvin Ivan Barrow Sr, Nellie May Barrow Francis, Leon C Barrow, and Lillian Marie Barrow Scoma. And, they were the parents of Clyde Chestnut Barrow. Clyde Chestnut Barrow was born on 24 March 1909, in Telico, Texas. He was the fifth of seven children born into a family lacking in worldly riches but a close-knit farming family. His family’s farm failed due to drought and they eventually moved to Dallas, Texas. Clyde Chestnut Barrow, who was a small and unassuming boy, attended school until the age of 16 and had ambitions of becoming a musician, learning to play both the guitar and saxophone. However, under the influence of his older brother, Buck, Clyde soon turned to a life of crime. Beginning with petty thievery, then graduating to stealing cars, Clyde soon escalated his activities to armed robbery. 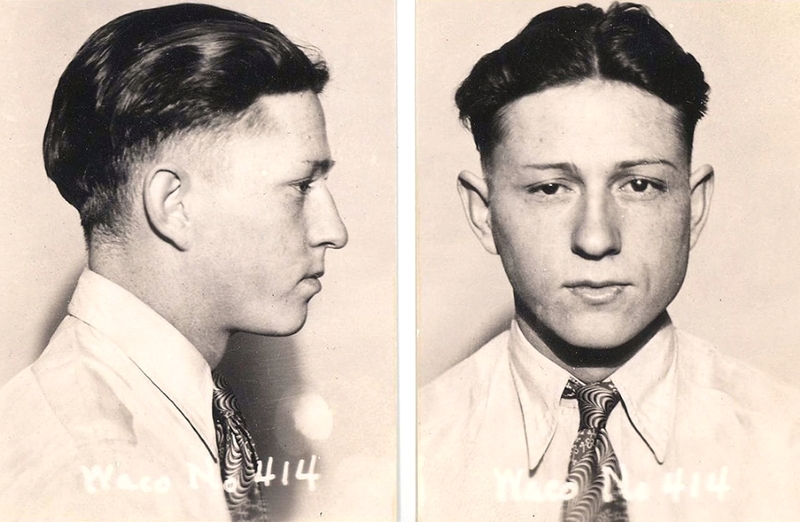 By late 1929, at the age of 20, Clyde was already a fugitive from the law, wanted by authorities for several robberies. And then he joined with Bonnie. In January 1930, Clyde met a 19-year-old waitress named Bonnie Parker through a mutual friend and was immediately smitten. But after spending much time together during the following weeks, their budding romance was interrupted when Clyde was arrested and convicted on various counts of auto theft. Once in prison, Clyde’s thoughts turned to escape. By this time, he and Bonnie had fallen deeply in love, and Clyde was overtaken by heartache. Sharing his sentiments, much to the dismay of her mother, a lovesick Bonnie was more than willing to help the man she called her soulmate, and soon after his conviction she smuggled a gun into the prison for him. On March 11, 1930, Clyde used the weapon to escape with his cellmates, but they were captured a week later. Clyde was then sentenced to 14 years of hard labor, eventually being transferred to Eastham State Farm, where he was repeatedly sexually assaulted by another inmate. It did not end well for Bonnie and Clyde, even when the shootout happened and they were killed, they were so famous that souvenir seekers ravaged the scene, cutting one of Clyde’s ears for a take home souvenir. They wanted to be buried together or side by side, but their wish was not granted as they were buried separately.